Jared Kushner has a lot on his plate right now. As a senior advisor (and son-in-law) to President Trump, Kushner is heading the new White House Office of American Innovation, engaging in diplomatic talks with China, and is even visiting Iraq right now. But that last fact was thrown into question overnight as Reuters retracted its article about Kushner visiting the Middle East. The New York Times broke the story that Kushner, who has no real diplomatic experience, was currently in Iraq at the invitation of General Joseph F. Dunford Jr., the chairman of the Joint Chiefs of Staff. The story was repeated by practically every American news outlet last night, including NBC News, CNN, and Fox News, each claiming to have confirmation of this from an unnamed source or sources. The news outlet Reuters published its own version of the story last night (cached link via the Wayback Machine), also citing an anonymous senior White House official. But then something weird happened around 3:08am Eastern time. Reuters published a tweet which appeared to retract the story. 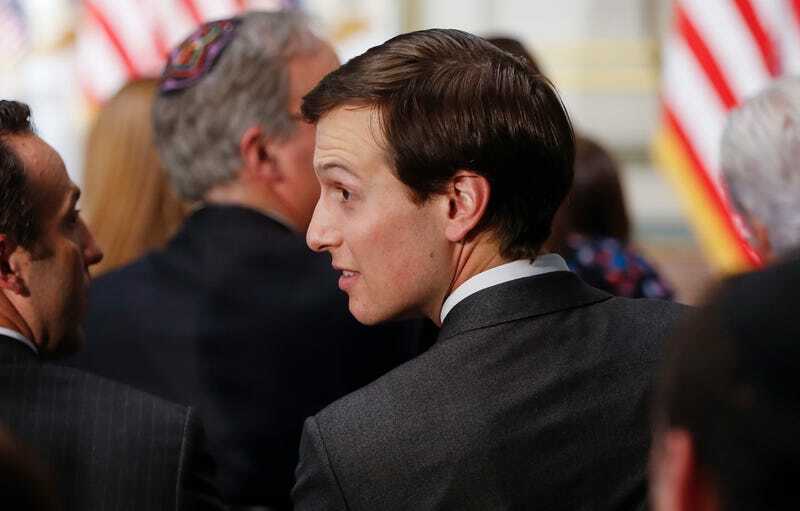 The story “Trump son-in-law Jared Kushner visits Iraq, U.S. official says”, the accompanying alert and subsequent update are wrong and are withdrawn. And then Reuters... deleted the tweet retracting the story. But the original story is still scrubbed from Reuters and contains the single line saying that the story had been withdrawn. The entire situation is very weird, to say the least. [Update, 7:40am: Reuters just published a new story at 7:33am by Phil Stewart with a dateline from Baghdad confirming that Kushner arrived in Iraq today. It’s still unclear why the news org decided to retract the original story without explanation. Our story erroneously stated that Jared Kushner and General Joseph Dunford, chairman of the Joint Chiefs of Staff, were in Iraq when they were actually en route to Iraq. We withdrew, rather than corrected, the story because the terms of the embargo did not permit us to disclose the specifics of their itinerary until their arrival in Iraq. President Trump’s favorite TV show, Fox & Friends, has even reported on the visit this morning. But that hasn’t stopped countless people who have noticed that the Reuters story got pulled from crying foul. Many people online are using that term that has gotten quite a workout over the past few months: “fake news”. Multiple calls by Gizmodo to the Joint Chiefs media office went unanswered early this morning. And we’re now in the strange position of not knowing what the hell is going on with one of Donald Trump’s most trusted advisors. Either Kushner is in Iraq, which is just weird for a number of reasons, not least because he doesn’t have any foreign policy experience and his visit to the country would be before Secretary of State Rex Tillerson had even visited. Or the other option is that Kushner isn’t in Iraq, which means that a single White House official or officials told multiple news outlets incorrect information. If you know what’s going on with Kushner in Iraq drop us a line: novak@gizmodo.com.